Sharon Jones & The Dap-Kings – Got A Thing On My Mind, Pt. 1 – Just Another Social Profile Really. I stumbled upon the Dap-Kings recently when they were called into remix (re-record more like) Ben Westbeech’s So Good Today. 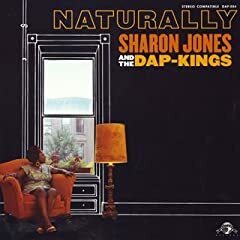 So when I was lucky enough to get some vouchers for the excellent (if rather moody) Phonica I decided to pick up the album Naturally by Sharon Jones & The Dap-Kings. And having fallen in love with that, I went looking for more music by this wonderful band. Got A Thing On My Mind, Pt. 1 is taken from a collection of songs from the Daptone label called the Daptone 7 Inch Singles Collection and is an absolutely beautiful blast of pure soul funk. It’s as if The J.B.’s had been put suspended animation, along with one of James Brown’s numerous funky divas, and have just been released to send forth amazing funk to solve the world’s ills. The album also includes an amazing cover of What Have You Done For Me Lately by Janet Jackson. Yes, that Janet Jackson. Obviously, they divide it into Pt. 1 & Pt. 2. Whilst Got A Thing On My Mind, Pt. 1 is utterly retro (right down to the Pt.1 in the title), it’s totally fresh at the same time. It’s great music, performed by amazing musicians, who obviously love what they’re doing more than life itself. And when an entirely average band like Klaxons (who sound like nothing more than every other bunch of white art-school kids have learned how to play guitars & keyboards at the same time) can claim that they’ve made “the most forward-thinking record” of 2007, then music this good sounds positively futuristic. Here’s to Sharon Jones & The Dap-Kings; shaping the future whilst looking to the past. PS – I can’t seem to find any videos of the band (except for badly filmed live performances) so check out this wonderful performance by Sharon Jones & The Dap-Kings from US TV.